The brain is fascinating to teach but simplifying it down to a level that high school students will grasp can be difficult as it can be a little overwhelming. I have been teaching this topic for years as I am the only teacher and department in my building to teach about the brain…Woo Hoo! The lessons and activities included are tried and true and have been tweaked and revised as I find new ways to teach this material. 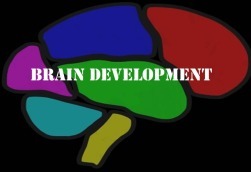 So if you’ve always wanted to teach about the brain in your child development class, challenge your dendrites to learn something new and give it a try! 11.4.12 A Analyze current research on existing theories in child development and its impact on parenting (e.g., Piaget, Erikson, and prior findings versus new brain development research). Pass out activity cards requiring students to perform a specific activity from their younger years like recite the alphabet, pat their head and rub their belly, complete a math problem, etc. and then discuss how they were able to do these things so many years later? Thanks to the brain we are able to remember these things…some because of long term memory, some because of repetition of learning it years ago and some because we use it daily. Begin talking about the brains make up of neurons. Each neuron is made up of dendrites, cell bodies and axons. Explain what the function of each its and then have students participate in the sensory relay activity (included in lesson plan). Following that activity have students see a neuron in action by watching this clip. Discuss how pathways are formed which allow children to learn and how neurons operate under a “use it or lose it” theory. To see this as an analogy to the internet, view this clip titled BRAIN POWER. To illustrate that we need to continuously challenge our brains, have students participate in a variety of activities that will challenge their brains such as the timed Stroops Effect (PPT activity), say the alphabet backwards…time it forward and backwards for fun, and the Brain Games PPT activity (free from TPT). Now it’s time for Brain Trivia…show the PPT using a variety of pictures asking what each has in common with the brain: walnut, bleu cheese, grain of rice, pink/grey jello jigglers and pruning shears. Go over responses and correct answers and take notes on additional brain trivia information. Brain Diagram: project the diagram on the SMARTBOARD and identify and discuss the basic brain parts and color in the diagram and take notes of the functions of each part. These notes and some activities to illustrate some of the brain parts are included in the lesson plan below. Using the trivia information, completed notes and brain diagram, have students complete the “Brain Activities” reinforcement activity. View “The Secret Life of the Baby’s Brain” on YouTube. Conclude with important things we need to do as parents to promote healthy brain development and assign the Brain Model with Song/RAP project. I am currently doing this lesson with my FACSII clas and they are enjoying it and responding well. It is put together well. I had a hard time labeling my own "brain worksheet". It would be great to have the answers provided. I also added the teenage brain video, which spurred great discussion on the use of drugs and alcohol. Thank you so much! Glad to know your students are enjoying the brain lesson and activities…mine always do! I will work on getting a key to the brain diagram. I am never disappointed–every single chapter I am going to teach I always check here for a lesson to help me with creative ideas and 'I always find them! I am always so pleased. This lesson is so wonderful as well—– and again– hands on, fun, educational activities which keep the students engaged. Fantastic!